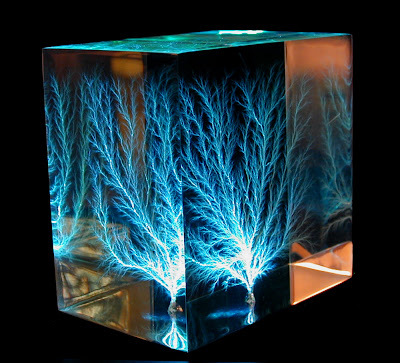 Lichtenberg figures and the associated 'electrical treeing effect' have been studied scientifically since the 1700's and known since ancient times. Heinrich Hertz used them in his proofs of James Clerk Maxwell's famous equations, and the physics involved inspired the creation of the photocopier. They're created when a dielectric — a material that resists the flow of electricity — experiences a catastrophic failure. As such, they're often found in failed insulation when high-voltage equipment kills itself. If you are unlucky enough to be struck directly by lightning, you may receive a Lichtenberg figure tattoo, sometimes called a 'Lichtenberg Flower' (Google Image Search at your own risk). Anyone can build a high-voltage generator of this sort for under $25. If there's interest, I can post detailed designs for some of my generators. Not surprisingly, they're pretty dangerous when mishandled. Other artists have also used dielectric breakdown to very cool effect.